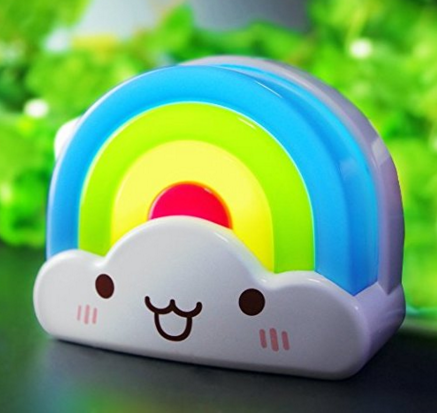 Rainbow Toddler Nightlight With Voice Light Sensor Just $10 Down From $30! You are here: Home / Great Deals / Amazon Deals / Rainbow Toddler Nightlight With Voice Light Sensor Just $10 Down From $30! Here’s a great Amazon deal on Rainbow Toddler Nightlight With Voice Light Sensor for just $10 down from $30! Get yours now while it lasts! Safe to Use: Made of ABS and PS non-toxic materials, cool to touch, it’s a beautiful wall decoration during the day and activated a gorgeous colorful glow at night. Soft Night Light for Babies: Soft light from the smiley face and pastel colors lampshade helps soothing kids away from darkness fear and won’t dazzle their eyes. Light Sensor or Voice & Light Sensor Control: Slide switch on the back, it will turn on automatically in darkness or be activated by sound and dark ambient.